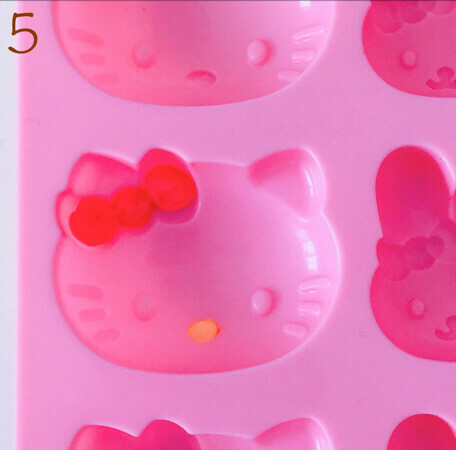 2: add water (3 tablespoons) to the gelatin (5g) and heat it in a microwave oven(15 to 20 seconds). 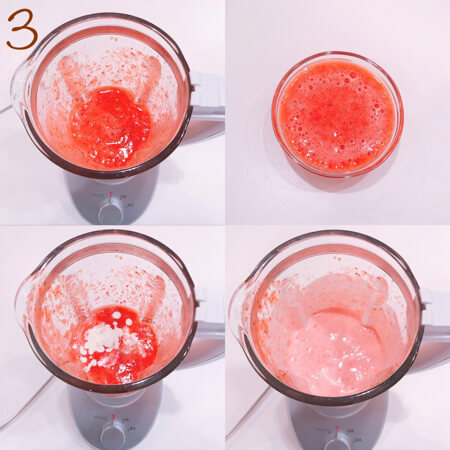 ①Put strawberries, sugar and lemon juice into a mixer and mix them well. Part of the sauce (80g) will be used as a topping sauce. Set this aside. 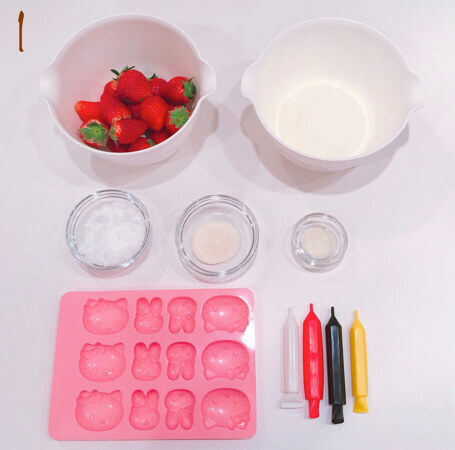 ➁Put fresh cream and the gelatin/water into ① and mix them well. 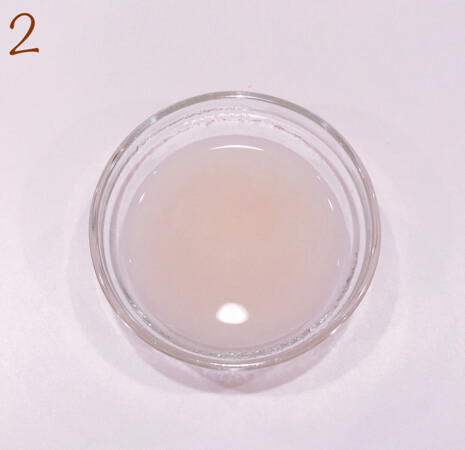 ①Put the contents of 3 into a container and cool it in the refrigerator. ➁Decorate the topping sauce (3:①) on top of ①. 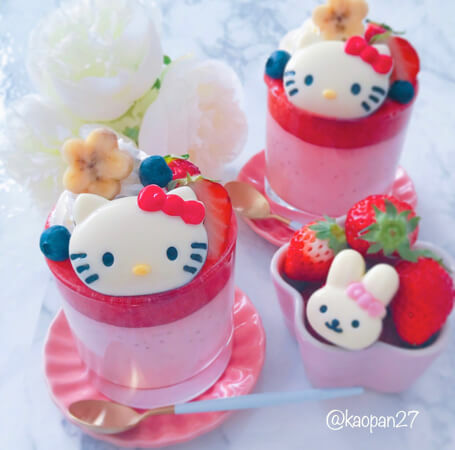 ③Put sliced strawberries on top of ➁.
Pour red chocolate into the cut out (ribbon) and yellow chocolate in to the same cut out (nose). After the chocolate hardens, pour white chocolate (bottom) and then regular chocolate (top) on top. After all the chocolate get hard, draw the facial parts including eyes and whiskers using chocolate. ☆It is recommended that you make the chocolate a day earlier. 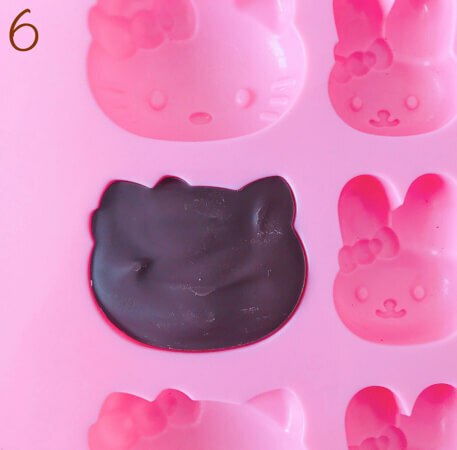 Place fresh cream, the fruit of your choice and KITTY Chan’s chocolate on the top of your sweets item. 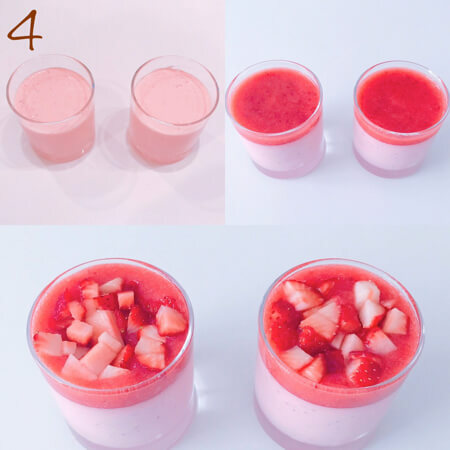 By using strawberries, you can enjoy the fresh sweet/sour flavor! Kaori’s easy recipe – learn how to make a “Kitty’s rice burger”!